Yohji Yamamoto and adidas mark Y-3’s 15th anniversary as a moment to look forward. As a result, Spring/Summer 2018 follows a simple directive: fuse the best of Yohji with the best of adidas to imagine new breakthroughs in apparel and footwear. 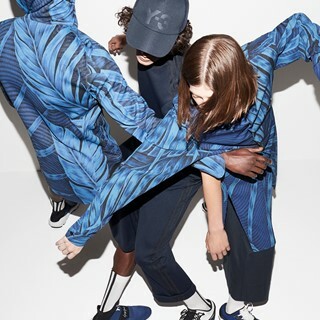 This creative concept—returning to the core DNA of its makers—is reflected in Chapter 2 of the brand campaign, which highlights the collection’s second retail drop. Photographed by Alessio Bolzoni and styled by Mauricio Nardi, Chapter 2 captures models against an array of colorful backdrops. Bolzoni’s stark flash lighting casts dramatic shadows behind each silhouette, emphasizing the collection’s bold new shapes and styles. This aesthetic language complements the graphic nature of this season’s apparel. Chapter 2 sees a new visual featuring Japanese cobra and leopard illustrations created by Yohji Yamamoto’s long-time collaborator Mr. Taishi Hayashi. These images are emblazoned and embroidered on long shirts, hoodies, t-shirts, and cross-body bags. The season’s silhouette is loose, voluminous, and cut generously away from the body. The classic adidas three-stripe sweatpants are rendered in XXL sizing and styled with billowing tees. Breaking the minimal and largely monochrome color palette is a lush, jungle-inspired, all-over print button-down shirt a print also designed by Mr. Taishi Hayashi. The latest drop of the Spring/Summer 2018 collection is available at Y-3 flagship stores, Y-3.com, and select retailers worldwide.